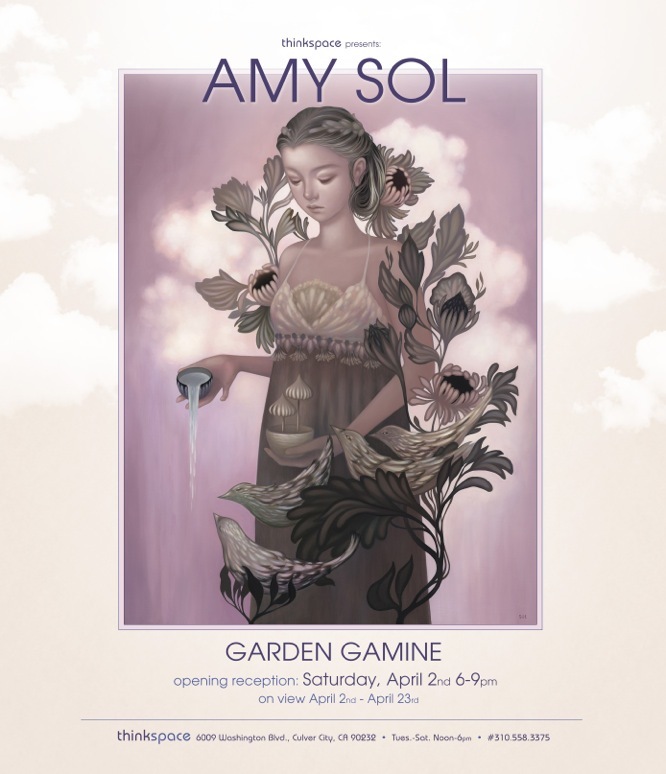 (Los Angeles) – Thinkspace is pleased to present Garden Gamine, featuring new works by Amy Sol. Born in Korea, where she spent much of her childhood, Sol now lives and works in Las Vegas, NV. A self-taught artist, she has developed and refined an intuitive technique over many years, mixing her own unique pigments and mediums to create signature palettes, and working primarily in thinly layered acrylic on wood panel. Her illustrative paintings and works on paper are dreamy and beautifully stylized. An artist whoembraces the Golden Age of illustration’s simple expression of narrative, Sol’s concise work perfects visual storytelling with fantastic imagery. Sol is known for her paintings of graceful nymph-like girls and their sympathetic animal companions. Fundamentally a storyteller, her images capture surreal encounters, moments, and characters. Her figures seem suspended in dreamlike states, arrested in thoughtful and meditative trances. The ambiguous postponement of time and action in the works contributes to their otherworldliness; they are somehow nostalgic and frozen, like glimpses into a fabled past or a mythic, narrative dimension. Owing to this feeling of whimsical detachment and playful idealization, her imagery conveys an almost childlike sensibility. Though Sol explores imaginative themes that fascinated her in her childhood, she incorporates a subtle element of melancholy, a quiet shadow of adult sadness and reserve to deepen and offset the overall tone of the works. 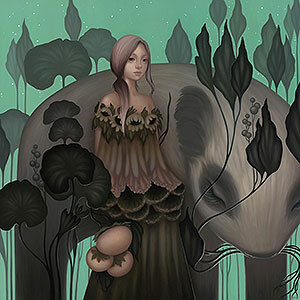 Inspired by a variety of graphic and artistic traditions, Amy Sol combines several aesthetic influences in her imagery. Among them, she cites Japanese Manga, Korean folk-art, Celadon ceramics, Japanese Studio Ghibli animation, Disney, and vintage 19th century and early 20th century illustration. Among the Golden Age era of illustrators she admires are Arthur Rackham, known for his phenomenally detailed line work and silhouette cuts, and Kay Nielsen, an early 20th century Danish, Art Nouveau illustrator who eventually created for early Disney. Her understated palettes, use of natural imagery, and preference for graphic and linear detail attest to her love of early vintage illustration, while her cartoon-like animal companions and their surreal, childlike encounters, reveal an affinity for stylized comics. The combination is undeniably spellbinding. The dreamscapes in which Sol’s characters find themselves tend to be sparse, abstract, and atmospheric, contributing to an overall sense of surreal dislocation. Preferring to paint on wood panel for its smoothness and organic texture, Sol balances the linear and graphic quality of her aesthetic with a feeling of softness, flow, and warmth. Her custom palettes are entirely her own, and in this new body of work she continues to explore the possibilities of monochromatic ranges, moving away from golden muted sepias to the incorporation of warmer, and more saturated, pink and purple hues.